Inside the palanquin that is heading to the city gate, is sitting with smiling shaman Wol who is about to open the door. 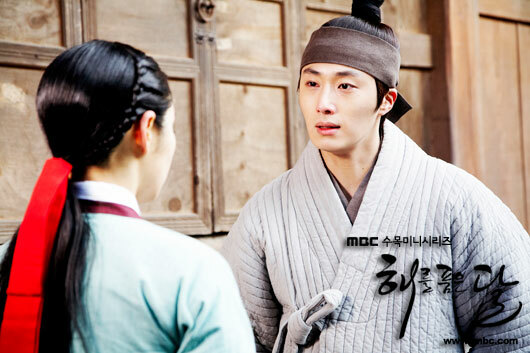 Wol is the substitute for Nok Young who refuses to return to the palace to treat the king’s sickness. Wol is abducted and brings back to the palace for the good of the people under the name of Nok Young’s spiritual daughter. During a brief chaos, Wol attempts to run away but falls into difficult position. At this time, she receives help from a master, and the master is actually disguised by Yang Myung. Yang Myung does not recognize Wol, so under such a confusing situation, Yang Myung lets slip Yeon Woo who is in despair state. On the other hand, Wol is caught back into the palace and is hurriedly sent to Lee Hwon’s palace harem as the shaman to control his adversity.